There's a running joke that British people like to have separate hot and cold taps, so that we can alternately scald and freeze our hands while getting washed - but this stereotype is changing both on basins and on baths. 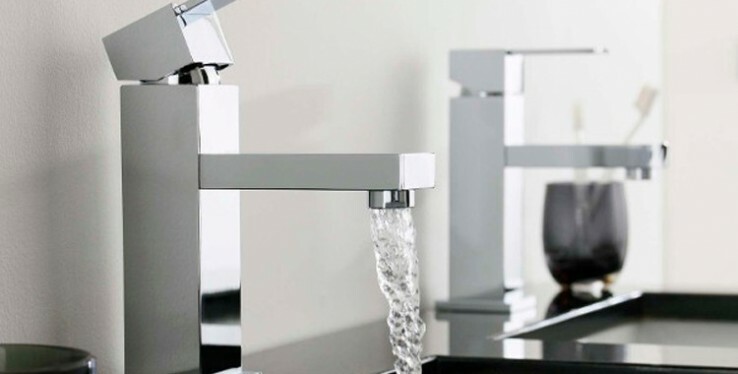 Mono mixers are an increasingly popular brassware option, and it is worth remembering that 'brassware' is a general term for taps and mixers, whether they are made of brass, chrome, stainless steel or some other material. Today you can get mono mixers with individual tap controls for the hot and cold supply, as well as single-lever mixers where you rotate the lever from left to right to adjust the temperature, and lift it to increase the water flow rate. You can choose mixer taps where the water is visible as it flows along an exposed channel and over the end, like a river reaching the edge of a waterfall, and this produces a pleasing naturally mixed effect. For baths in particular, there are much wider versions of this same effect, so that the water flows into the bath as a fluid curtain - perfect if you like to sit in the bath while it is filling, or top it up with hot water to stay in for longer, as the water that lands in the bath should be properly mixed to your desired temperature. And of course, each designer range will typically include complementary basin and bath mixers, so you can have a consistent aesthetic across all of your bathroom's brassware. Our designer taps and brassware incorporate the latest modern designs, in particular the minimalist cubic shapes that have been in fashion in recent years. These can create highly space-efficient mixers for baths, complete with individual tap controls, mixer spout, and matching rectangular shower head with hose - everything you need for a practical bath, but still with high levels of aesthetic quality too. Look out for our special offers on designer taps and brassware, for end-of-line and ex-display deals that often offer reductions of half price and more, compared with our original selling prices.